Risk is one of the things that we should be mindful of when we invest, particularly in terms of the "riskiness" of investment alternatives that are available to us, our capacity to take on risk, and our attitude towards risk. "Investment risk" may be interpreted a number of ways, and one widely-used measure is the volatility or standard deviation of returns. "Risky" investments such as stocks provide highly unpredictable returns, with high standard deviations, while "safe" investments like money market funds have more stable, low-standard deviation, returns. Of course, the trade off is that riskier investments have higher average or expected returns than safer investments. 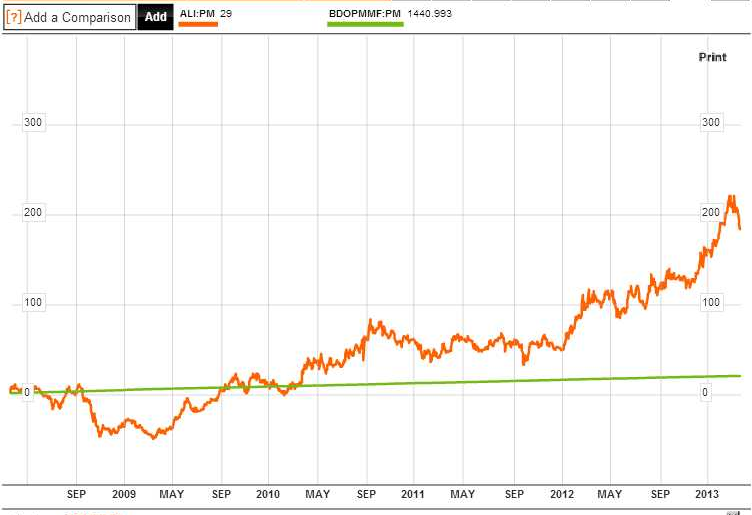 The difference in how "risky" and "safe" investments behave can be seen in the example below, where we plot the stock price movement of Ayala Land (ALI) in the past 5 years and compare it with BDO's Peso Money Market Fund (BDOPMMF). 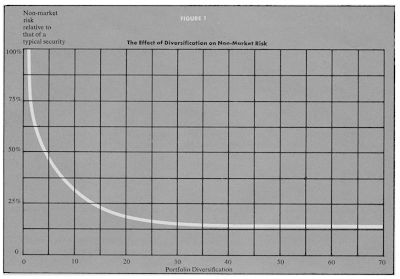 When we invest in individual stocks, as many investors in the middle of a bull market (such as the one we have now) seem to be very tempted to do, we expose ourselves to two kinds of investment risk: unique risk, risk that is unique to a particular industry or stock; and systematic risk, risk that affects all securities of one type or all securities in a particular market. Nobel laureate William Sharpe (remember the "Sharpe Ratio"? 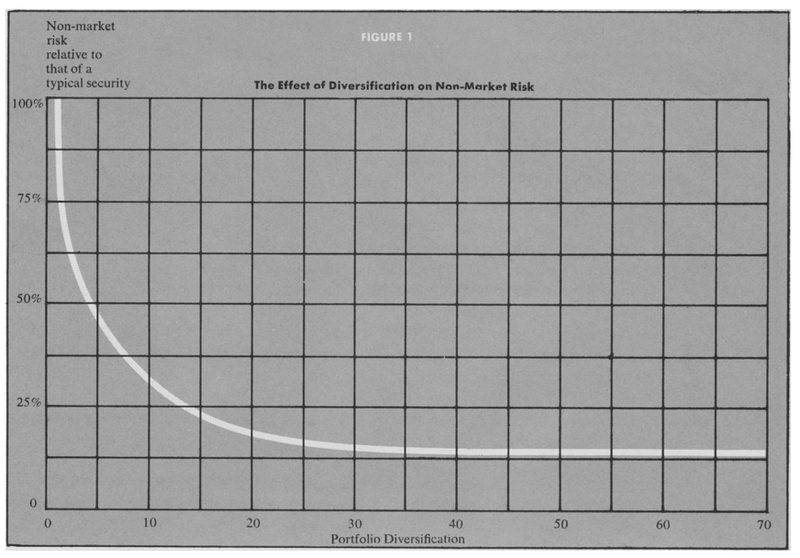 ), in his 1972 paper "Risk, Market Sensitivity, and Diversification," demonstrated that by simply adding more stocks to a stock portfolio, an investor can significantly reduce and eventually eliminate unique risk (or "non-market" or "diversifiable" risk). A point will be reached, however, where adding another stock will not make a difference anymore. At this point, all that remains is systematic risk, or what Prof. Sharpe refers to as "market risk"; here, the portfolio, for all intents and purposes, is the entire market. So when we pick stocks, we needlessly subject ourselves to unique risk, and that is not very "prudent" investing. As Prof. Sharpe has demonstrated in his paper, risk-wise we are better off holding the "market" portfolio, or in practical terms, any equity or index fund. Diversification is a protection against ignorance. It makes very little sense for those who know what they're doing. So if you can truly and honestly say that you know what you're doing, or if you have access to exclusive (i.e., "insider") information that lets you take advantage of market imperfections, then by all means, pick stocks or day trade or whatever. If you can't, then just buy a low-cost UITF or mutual fund of your choosing and sleep more soundly knowing that systematic risk is all you have to worry about. 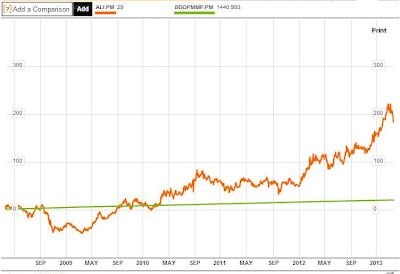 Do You Save Enough for Retirement?